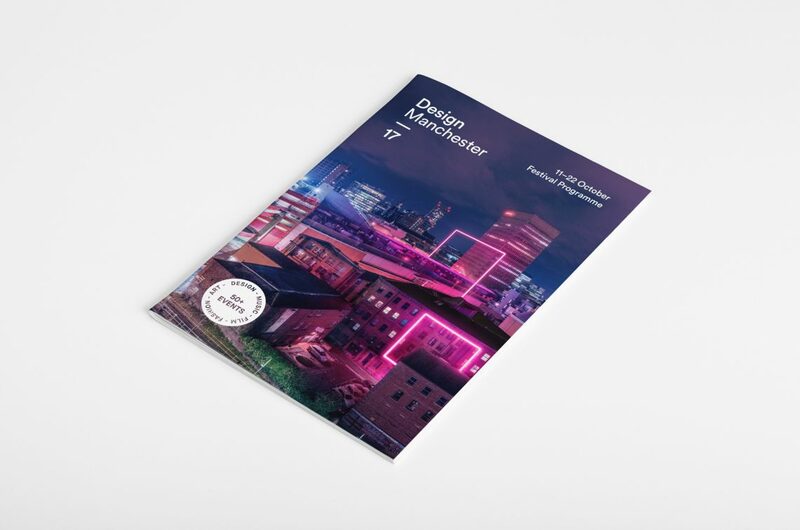 Over the last five years Design Manchester has grown at an incredible rate, not just our event numbers or attendees but our marketing activity across multiple channels. When we set out with the festival we worked with Manchester agency Music alongside our own in-house studio Instruct to develop the identity and name, something that was simple but also played second fiddle to the content which is the real focus. As we cover so many different aspects of design and need to appeal to a wide-range of people (including non-designers) it makes sense to collaborate with like-minded, local creatives on our campaigns and this year we tried something new… in a very tight time-frame. We attended local night Motion North to see our good friend Vera from FIELD and after a few drinks with friends Process Moving Image afterwards we went away with a few ideas bubbling away. This year music and in particular The Buzzcocks are a big feature, but so is our on-going conversation about Architecture within the city and what role design plays within it. We wanted to pay attention to the incredible growth happening all around us, framing elements but also reflecting the punk/DIY ethos that lit up the city over 40 years ago. We approached Process with a few ideas and our draft schedule to show the sorts of content we had planned and pretty quickly we started to formulate some solid ideas. It was clear we needed to work with not only a skilled photographer and artist but also someone familiar with post-production to realise these ideas, Process and ourselves were keen to work with Andrew Brooks and very quickly we found ourselves on a shoot purposely looking for rainfall in the city. ‘It was great to be working with Design Manchester again, creating photographs for the festival for the second year running. 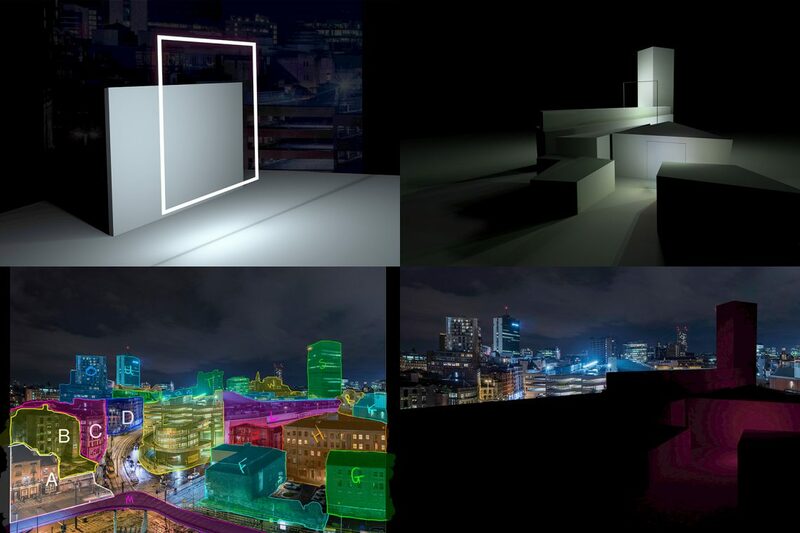 This time round it was a real Manchester collaboration and the chance for me to work with ‘Process’ for the first time. This was a great experience, bringing together different people from the cities creative scene is what this festival is all about. Andrew at work around the city, in the rain! With the landscapes done it was Process’ turn to take over who set off drawing elements into 3D and mapping them across the cityscape. 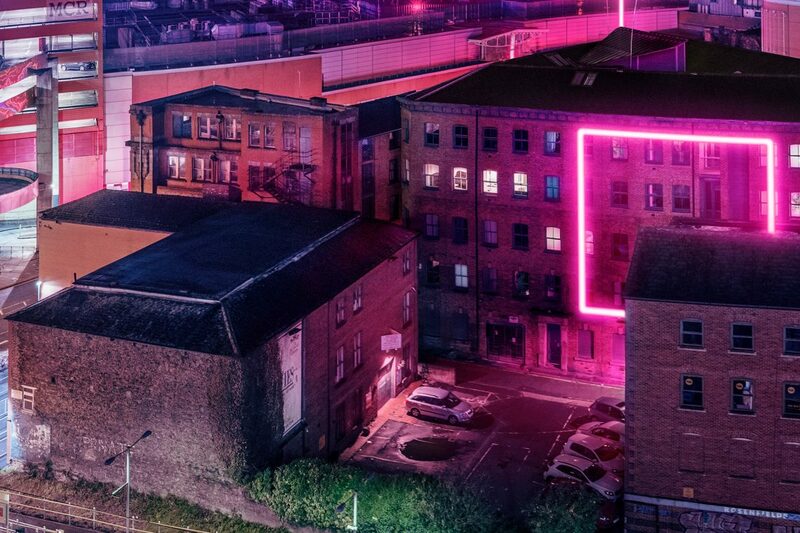 “As a Manchester based creative studio we were really honoured to be asked to collaborate on this years DM imagery – especially having watched how the festival has gone from strength to strength over the past few years. 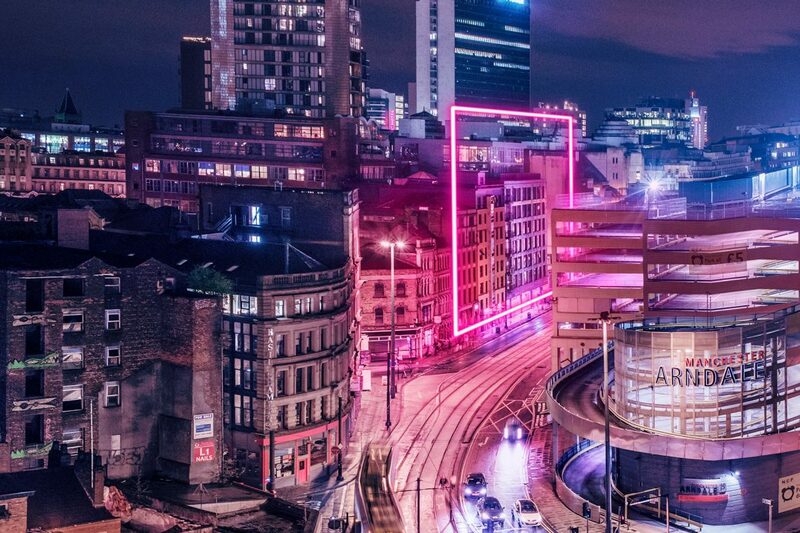 John at Instruct came to us with the idea of combining a neon pink DM logo with images of the City. After an initial chat we decided that a collaborative effort utilising Process’ visual FX and 3D skills, Andrew Brook’s photography, and Instruct’s art direction could be really interesting. 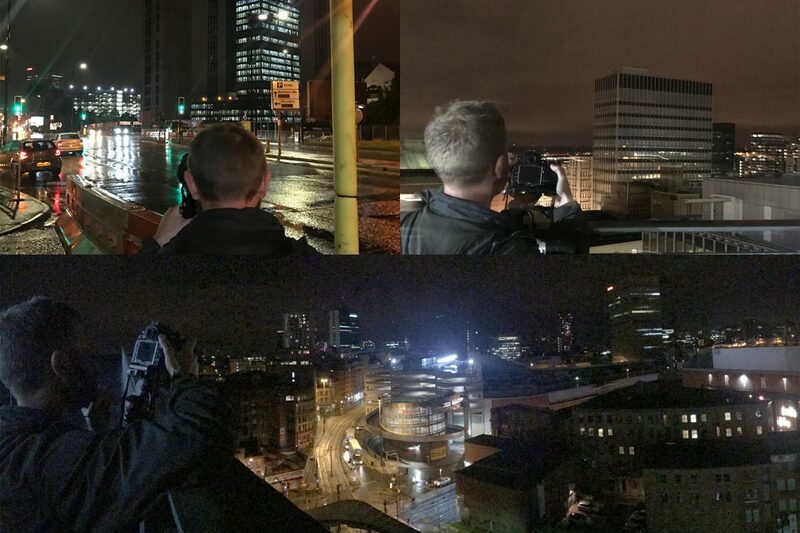 After a pretty wet night out Andrew put together a fantastic large format cityscape for us to work with. Technically this was a challenge as the composite image was shot with multiple focal lengths, making a straight up camera match in 3D impossible. To get around this we matched the focal lengths of the parts of the image that we needed to light in 3D and then built rough geometry of the city that allowed us to simulate light falloff. 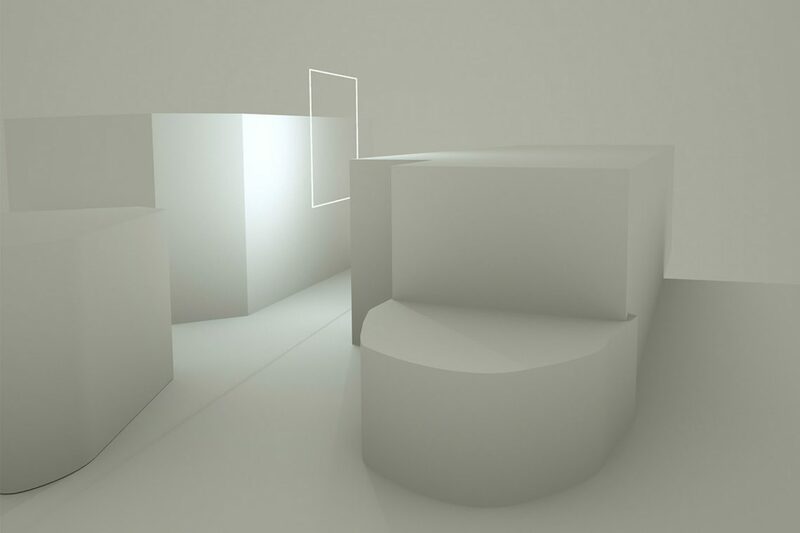 This was all rendered out in super high resolution using the unbiased render engine Octane. Once these renders were brought into Photoshop, we were ready to step back into art direction world and with a lot of tweaking of layers / tilting our heads to the side we went about creating the final imagery. We love jobs like this in the studio as it uses all of our individual skillsets and is a real team effort. With all of the print and outdoor materials out for distribution Process then went to work developing our opening sequence to be used across various events, truly bringing the concept to life.